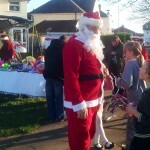 Santa asked the West Beach children if they had been good during the past year, great news, they all said yes! The kids all went home with a present. 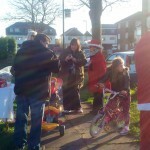 Everyone enjoyed the day, the sun shone and mince pies & hot mulled wine for mums and Dads went down a treat. A Christmas tree was gifted by a resident family along with a huge fruit & veg hamper, our thanks to all the residents for their generous donations of raffle prizes from which we collected £86 and was donated to charity. To all you mums & dads who waved to Santa when driving off the estate, please stop off with the kids next year, it’s fun & it’s free.